My name is Annie. 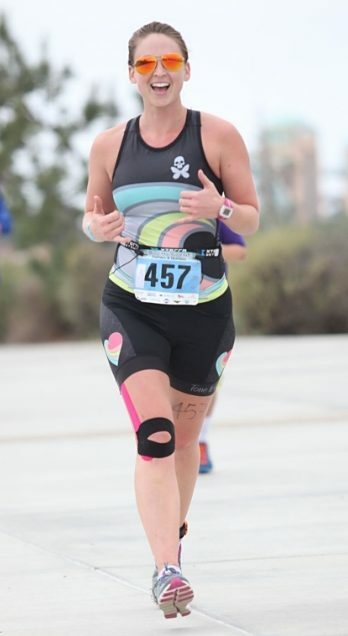 I’m a 30something San Diegan, dog mom, entrepreneur, competitor, terrible swimmer, decent cyclist, turtle-paced runner. And I’m a triathlete. I was 23 at the time. The years rolled by. Every year the Kona coverage would come on and I would think, “I want to do a triathlon. I’m going to do a triathlon before I turn 30.” I changed jobs. I got married. I bought a house. I turned 29. And still no triathlon. It was time to put up or shut up. So I registered for a race that would have me completing my first triathlon three months before my 30th birthday. My main fear was not injury or death. I wasn’t worried about drowning during the swim, crashing on the bike, or collapsing on the run. No. I was afraid of looking like an idiot. I just did not want to look like I had a sign on my back that screamed NEWBIE! Strange, how the threat of injury to pride trumps any fear of bodily harm. This thought of being the newbie, the beginner- it gave me major anxiety! And when I’m anxious, I do research. I read every beginner triathlete article out there, absorbing the same “first timer” tips they all seemed to share. Organize your gear ahead of time. Don’t try anything new on race day. Practice your transitions. Have fun! Have fun. How can I have fun when I don’t know what I’m doing??? Other research I found was much more technical. Nutrition. Strengthening workouts. Bike gear. Run cadence. Swim stroke technique. Tips and tricks aimed at helping experienced triathletes better their times. This time I felt like Goldielocks, unable to find her “just right” research. Welcome to The Anxious Triathlete.